Do you have a child that is a daredevil? A grandchild that has no fear? Are you like that? Me - No, I'm afraid of most things... but my husband doesnt a lot of fear in him. He was also the child who grew up with bruises, gashes, cuts on him constantly. One of the stories I hear from him is about a big "dirt clod" battle (never heard of dirt clod? me either...) - but he fell down a hill & hit his face on a metal peg causing him to bleed pretty well. So he ran home to have his mom tell him to "Go to Sylvia"... Ricky's mother is a fantastic woman... she just couldnt deal with blood. I met Sylvia a few years back & she told me stories of always seeing a "Bloody Ricky" quite often at her door. She would fix him up, make sure he's OK & send him home. So I asked some people through the week how they reacted to blood. Got the normal responses: I get faint... The smell gets to me... I call 911 .... A nurse told me that she finds the area that is bleeding, apply pressure, resolve to stop the bleeding & then proceed to call for help (Such a precise way to handle it)... & the best is from a 5 yr old who just said, "I yell for mommy"
Then you look & the Bible mentions "blood" over 400 times... so does God want us to get a reaction? I mean, we see the Nile was turned into blood by Moses's staff...we see that people put blood on their doors in trust during the Passover... we see animal sacrifices yearly for the atoment of sins ... we see a woman who bled for 12 years reaching out for healing... any reactions? Does the blood of Jesus give you a reaction? Or they'll go to him... but the opposite applies... because YOU arent going to him to fix him... He will Fix you... heal you... cover your sins with forgiveness through his blood. So what is your reaction when you think of Jesus' blood? 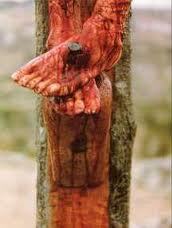 Just amazes me that he went through all the suffering and pain for me! I don't think we can even fully comprehend all that means until we see him in heaven one day, but for now--his blood is precious and I love Him back. Blood gives me the eeby jeebies. But...when I think of HIM - I'm so glad He shed His blood for me. Precious blood indeed! Awesome message. I pray I will always run to Him and not away. I've run away to many times. Now I just want to be as close as I can. And you know what? That's what He wants too. Hallelujah! Although I have both run away from and toward bloody children (I tend to react better when nobody else is here), I can honestly say that when I think of Jesus' blood, I am grateful. How many people would lay down their lives for another? I think this is a concept so foreign to most people...especially non-Christians. Why would someone do that? The simple answer is love...personified in Jesus.